Owen Wister, autor de la novela El virginiano, y amigo de Theodore Roosevelt. Casa donde nació Owen Wister en avenida Germantown 5203, en Filadelfia. Wister inició su obra literaria en 1891.​ Había pasado varios veranos en el oeste de Estados Unidos, haciendo su primer viaje a Wyoming en 1885. Al igual que su amigo Teddy Roosevelt, Wister estaba fascinado con las violentas tradiciones de esa región. En una visita a Yellowstone en 1893, Wister conoció al artista Frederic Remington, con quien siguieron siendo amigos toda la vida. Cuando empezó a escribir, naturalmente se inclinó hacia el escenario de la frontera con el Oeste. La obra más famosa de Wister sigue siendo la novela The Virginian, que escribió en 1902. En vez de presentar la versión mitificada de los vaqueros pobres, Wister elige ponerse del lado de los grandes terratenientes: su vaquero en realidad es un aristócrata. La suya se considera como la primera novela de vaqueros, y fue reimpresa catorce veces en ocho meses.​ Está dedicada a Theodore Roosevelt. Su hija, la poetisa Mary Channing Wister, se casó con el artista Andrew Dasburg en 1936. La escuela Mary Channing Wister School, en Filadelfia, recibió ese nombre en su honor. 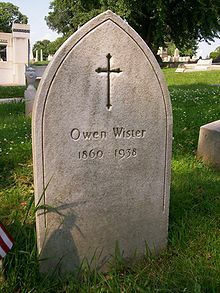 Tumba de Owen Wister, en el cementerio de Laurel Hill. Wister murió en su casa en Saunderstown (Rhode Island). Fue enterrado en el cementerio de Laurel Hill, en Filadelfia. Desde 1978, la editorial University of Wyoming Student Publications (publicaciones estudiantiles de la Universidad de Wyoming) ha publicado la revista anual de literatura y las artes Owen Wister Review. Hasta 1996 la revista se publicaba dos veces al año. En la primavera de 1997 se convirtió en una publicación anual. 1912-1915: Romney: And Other New Works about Philadelphia (escrito 1912-1915; publicado incompleto en 2001). 1901: Ulysses S. Grant (biografía). 1916: The Aftermath of Battle: With the Red Cross in France (preface to Edward D. Toland's autobiography). 1923: A Monograph of the Work of Mellor, Meigs, & Howe (contributor). 1970: The Illustrations of Frederic Remington (comentario). 1895: Red Men and White (aka Salvation Gap and Other Western Classics). 1911: Members of the Family (Illus. H. T. Dunn). 1892: Hank's Woman (en The Jimmyjohn Boss). 1892: How Lin McLean Went East (incorporado en Lin McLean). 1893: Em'ly (incorporado en The Virginian). 1893: The Winning of the Biscuit-Shooter (incorporado en Lin McLean). 1894: Balaam and Pedro (incorporado en The Virginian). 1894: The Promised Land (en The Jimmyjohn Boss). 1894: A Kinsman of Red Cloud (en The Jimmyjohn Boss). 1894: Little Big Horn Medicine (en Red Men and White). 1894: Specimen Jones (en Red Men and White). 1894: The Serenade at Siskiyou (en Red Men and White). 1894: The General's Bluff (en Red Men and White). 1894: Salvation Gap (en Red Men and White). 1895: Lin McLean's Honey-Moon (incorporado en Lin McLean). 1895: The Second Missouri Compromise (en Red Men and White). 1895: La Tinaja Bonita (en Red Men and White). 1895: A Pilgrim on the Gila (en Red Men and White). 1896: Where Fancy Was Bred (incorporado en The Virginian). 1897: Separ's Vigilante (incorporado en Lin McLean). 1897: Grandmother Stark (incorporado en The Virginian). 1897: Sharon's Choice (en The Jimmyjohn Boss). 1897: Destiny at Drybone (incorporado en Lin McLean). 1900: Twenty Minutes for Refreshments (en The Jimmyjohn Boss). 1900: Padre Ignazio (en The Jimmyjohn Boss). 1900: The Game and the Nation (incorporado en The Virginian). 1901: Mother (en Safe in the Arms of Croesus). 1901: Superstition Trail (incorporado en The Virginian). 1902: In a State of Sin (incorporado en The Virginian). 1902: The Vicious Circle (en The Saturday Evening Post, 13 de diciembre de 1902). 1902: With Malice Aforethought (incorporado en The Virginian). 1904: Stanwick's Business (en Safe in the Arms of Croesus). The Jimmyjohn Boss (en The Jimmyjohn Boss). Napoleon Shave-Tail (en The Jimmyjohn Boss). Happy Teeth (en Members of the Family). Spit-Cat Creek (en Members of the Family). In the Back (en Members of the Family). 1907: How Doth the Simple Spelling Bee (Illus. Frederic Rodrigo Gruger) (en Safe in the Arms of Croesus). 1908: Timberline (en Members of the Family). 1908: The Gift Horse (en Members of the Family). 1909: Extra Dry (en Members of the Family). 1911: Where It Was (en Members of the Family). 1911: The Drake Who Had Means of His Own (en Members of the Family). Safe in the Arms of Croesus (en Safe in the Arms of Croesus). With the Coin of Her Life (en Safe in the Arms of Croesus). The Honeymoonshiners (en Safe in the Arms of Croesus). Bad Medicine (en When West Was West). Captain Quid (en When West Was West). Once Round the Clock (en When West Was West). 1928: The Right Honorable, The Strawberries (en When West Was West). 1928: Little Old Scaffold (en When West Was West). 1928: Absalom of Moulting Pelican (en When West Was West). Lone Fountain (en When West Was West). Skip to My Loo (en When West Was West). 1928: At the Sign of the Last Chance (en When West Was West). 1934: John Jay Chapman (ensayo). 1890: "The Pale Cast of Thought"
1890: "From Beyond the Sea"
1897: "Autumn on Wind River"
1902: Done In The Open (ilustrado por Frederic Remington). The Dragon of Wantley (inédita). The Honeymoonshiners (publicada en la colección de cuentos Safe in the Arms of Croesus). Slaves of the Ring (inédita). 2000: The Virginian (película de 2000) con Bill Pullman, Diane Lane, John Savage, Colm Feore y Dennis Weaver. Wikimedia Commons alberga una categoría multimedia sobre Owen Wister. Cobbs, J. L.: Owen Wister. Boston: Twayne, 1984. Payne, D.: Owen Wister: chronickler of the west, gentelman of the east. Dallas: Southern Methodist University Press, 1985. ↑ Randy F. Nelson: The almanac of american letters. Los Altos (California): William Kaufmann, 1981. Pág. 44. ISBN 0-86576-008-X. ↑ Alan Jalowitz: Owen Wister Biography. Archivado el 2 de agosto de 2009 en la Wayback Machine. Penn State University. Archivado el 26 de octubre de 2015 en la Wayback Machine., La Salle University, 1994. ↑ «Owen Wister: brief life of a mythmaker», artículo en inglés de Castle Freeman, Jr., en la revista Harvard Magazine, 2002. ↑ a b «Wister, Owen», artículo en la Collier's New Encyclopedia, 1921. ↑ Randy F. Nelson: The almanac of american letters. Los Altos (California): William Kaufmann, 1981. Pág. 287. ISBN 0-86576-008-X. Archivado el 3 de marzo de 2016 en la Wayback Machine., La Salle University. ↑ «Obituary», artículo en The New York Times, 25 de agosto de 1913, pág. 5. ↑ National Park Service: «Glimpses of our national parks: the Grand Teton National Park, 2000. Archivado el 6 de agosto de 2007 en la Wayback Machine., artículo en inglés de Helen Ellsberg en el Journal of San Diego History, invierno de 1982. ↑ «God's garden: the Grossmont Art Colony», artículo en inglés de Kathleen Crawford en el Journal of San Diego History, otoño de 1985.